Our homes would not be perfect without rugs. Rugs make a room feel complete. This is the only material you can eat, sleep and walk around on. Rugs make our homes look beautiful. Fibers are used to make rugs. There are various kinds of area rugs, and these are some of the examples. These are the type of rugs that are normally positioned in narrow areas, and they are rectangular. Runner rugs are great for your home. They will make it look more beautiful and will also prevent your floor from getting damaged. This is particularly if they are placed in spaces with high traffic. They are suited for narrow places because they are also narrow and long. These rugs are available in a variety of sizes, colors, shapes, and patterns. They are aesthetically pleasing, practical and easy to maintain. Runner rugs are excellent for indoor spaces. A stairway runner is a portion of a carpet that only cover a part of the stair, and this part is usually the center. People typically put stair runners over tiled stairs or hardwood. You can get these stairway runners in almost every color and pattern. Their widths also vary greatly. A stairway runner makes the staircase safer. Stepping on tiled stairs or wood can feel slippery, and this makes it easy for someone to slip and fall. The danger is notably increased if you have kids, pets or seniors living with you. Having a stairway runner reduces this danger, and it makes the stairs quieter because of its ability to absorb noise. Outdoor rugs were originally used to make plain outdoor spaces look like beautiful outdoor rooms. These rugs are usually durable and can resist fade and weather. That is why they were suited for outdoors. However, people discovered that they work well with indoor spaces as well and they started using them for both indoors and outdoors. Homeowners use them to decorate their homes because they are fashionable too. They bring that color that your needs and simply complete the look of your upholstery interior décor. You can install indoor rugs in places with high traffic because of their durability and style. If you have children and pets, then you need these rugs too because they can withstand the pressure exerted by children and pets. Rugs with solid colors are great. However, print makes a room look more beautiful in an unexplainable way. It doesn’t matter whether you fear loud patterns because there are numerous types of patterned rugs so you will not fail to get one that you will like. Patterned rugs can help make a statement or subtly blend in with your other pieces. You can choose a patterned rug depending on what you want to achieve. You will be spoilt for choice when you decide to buy area rugs because there are numerous options to choose from. The most important thing is to know what you want an area rug to do in your home, and you will know the one you need to pick. We usually buy rugs for different reasons, and one of them is the comfort. It is vital to know about the different types of rugs and the ones that will give you what you are specifically looking for. Here are some of the best styles of area rugs for comfort. Wool is a material that is both durable and soft to the touch. If you are looking for something that will provide you comfort, then you need to try wool rugs. There are various types of wool rugs, but the hand-made ones are the best regarding durability and softness. Also, wool rugs can take the pressure associated with high traffic areas like the dining rooms and living rooms. They are built to resist water and stains naturally. It can’t get any better than this. Nothing says ‘luxury’ better than silk. Silk rugs are very delicate and have a kind of softness that cannot be compared to any other rug or material. 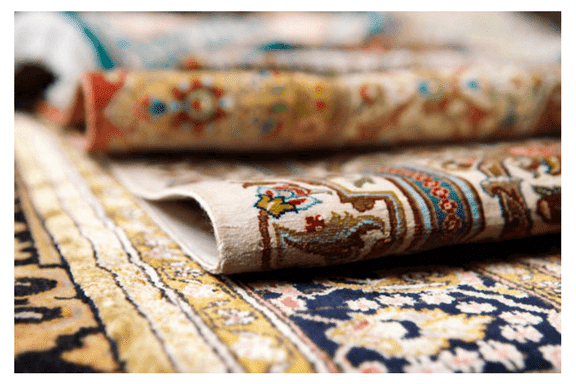 You should know that silk rugs are best installed in low-traffic areas because they are very sensitive to moisture and they cannot take the heavy wear. The best place to place your silk rug is in the bedroom where there is no heavy traffic. Sometimes, manufacturers combine silk with other materials to produce a blended rug. The result is a rug that is both soft and durable. Such a rug can also have varied texture. Therefore, if you don’t find a pure silk rug, you can try out the blended ones provided they have that softness associated with silk. Cotton area rugs are another type of rug that has plenty of comforts. Most homeowners love it because it is not only long-lasting but are also easy to clean. Cotton rugs are available in flat and woven styles. The flat weaves are excellent in high traffic areas, and they are also soft. However, it is often washed using a machine. If you are looking for something that will be comfortable in the short-term, then cotton rugs will work for you. You can put them in the kids’ room, kitchen and casual areas. Area rugs made from hides are great for comfort. These rugs are very smooth and soft and are best suited for areas with low traffic. They are also easy to clean and easily attract moisture. The best place to have hides rugs are in the bedrooms or dry areas in the house. If you are looking for something that shows that you are stylish then hides rugs will do that for you. Sometimes leather and sheepskin are infused into the ordinary rugs, and other times they remain in their natural form. You can also use these rugs to layer on other rugs. Synthetic rugs are very smooth although they can feel artificial too. The best part about synthetic rugs is that they can be used as both indoor and outdoor rugs. The rugs can stand high traffic and are not sensitive to moisture and the sun. Also, it repels stains. You can put these in your mudrooms, entry, and hallways. Some areas in the house are usually exposed to a lot of traffic especially from the family. Examples of these areas include the living room (specifically near the furniture), the stairs, the children’s room, and the hallways among others. These areas may be exposed to wear and tear faster than other areas. That is why you need to carefully consider the type of area rug you need for high traffic areas. Here are a few you can choose from. Majority of wool rugs are excellent for areas with high traffic because of their durability. There are various types of wool rugs so you’ll not fail to get what suits you best. However, a few wool rugs are not great for high traffic areas, and you should avoid buying them. These are sisal rugs and those made from natural materials; a good example is a seagrass. These are absorbents, and they will take in spills and make the rug to wear faster. One trick you can use with wool rugs is to use them in combination with a pad. The pad underneath your wool rug will take the role of a shock absorber and therefore extend the life of your rug. Wool rugs do not do well in damp areas because of their ability to absorb humidity. Bamboo is a biodegradable material, and it is used to make rugs. Although a bamboo rug does not have the warmth and cushion that other rugs have, it is perfect for high traffic areas because it can withstand wear and tear for a long time. However, it is the best place to position this rug is inside the front door because it has a nonslip backing that is manufactured using PVC. The rug is available in different colors such as brown and natural tan. You can choose a black bamboo rug for an area with high traffic because it does not show dirt. This rug is flat, and it forms a layer when put over a tile. It is resilient. These rugs are manufactured using bulkier yarns. Nylon rugs may not be as soft as the wool ones, but it is not easy to crush their fibers as it is that of olefin rugs. The quality of nylon rugs is also better than that of olefin or polypropylene rugs. You can place a nylon rug under heavy furniture because its durability enables it to withstand the pressure and the traffic associated with furniture areas. Also, the rugs provide a low-maintenance floor covering. They can do this because their fibers are resistant to both fade and stain. Chem-Dry by the Millers offers carpet cleaning and additional services to homes and businesses in Eastern Pennsylvania.